Rep. Raúl M. Grijalva, D-Arizona, is a contributor to Writers on the Range, the opinion service of High Country News. He is the second-most senior member of the House Natural Resources Committee. During his confirmation hearing and throughout his time in office, Interior Secretary Ryan Zinke has presented himself as an admirer of Teddy Roosevelt and a believer in conservation. But less than a year into his tenure, his leadership has produced an existential crisis at the Department of the Interior. Zinke has surprised many with his willingness to support President Donald Trump’s extreme environmental policies, including the recent attempt to erase most of two national monuments in Utah from the map. Those policies have extended to the attempted dismantling of the Interior Department itself, which, as Zinke recently told Outside Magazine, he plans to reorganize along the lines of a “military command.” He indicated to Congress earlier this year that this plan will include losing approximately 4,000 Interior staff and slashing the department’s budget by $1.6 billion. This plan has not improved Interior’s already low staff morale, which Zinke damaged earlier this year when he claimed (inaccurately) that a large percentage of personnel were not loyal to “the flag.” To boost esprit de corps, he has installed a deer-hunting video game at headquarters and instituted “bring a dog to work day,” neither of which have had any effect on the underlying substantive reason employees are worried. Secretary Ryan Zinke wears a Navy SEAL hat while attending the Reading of the Names ceremony in Washington, D.C.
As part of his reorganization, Zinke intends to move the headquarters of several agencies more than a thousand miles from Washington, D.C., to be closer to what he calls “the front line.” As he describes it, these drastic moves will result in multiple agencies with different missions operating under what he calls a “Joint Management Agency” structure similar to a joint military command. 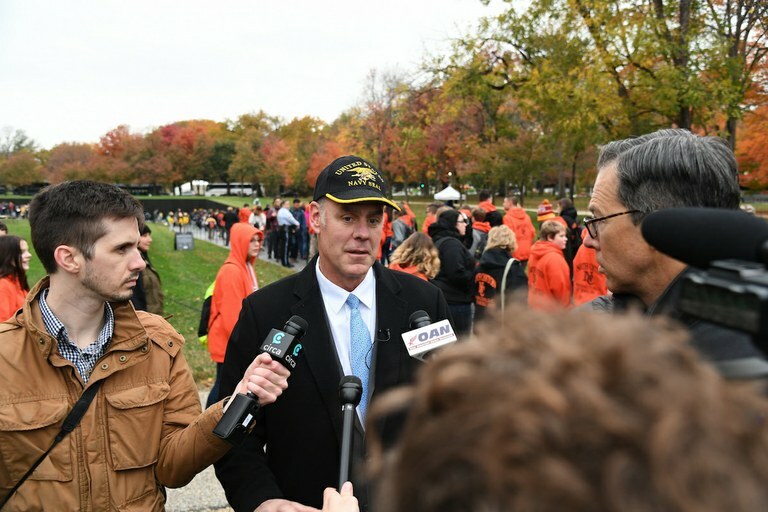 “That’s how we fight wars,” Zinke reportedly said in outlining his vision to employees at Alaska’s Denali National Park. Tellingly, this is just part of the secretary’s broader attempt to militarize the department he now oversees. As the Washington Post reported in October, the former Navy SEAL demands that a DOI employee raise a flag over the building whenever he enters his office in Washington and lower it when he leaves. He should read the literature on military management theory more closely. A 2012 Army War College research paper titled “Leading Change: Military Leadership in Civilian Organizations” describes what Zinke is doing and why it fails. As the paper argues, military leaders who take civilian leadership positions late in their careers often find the transition jarring and confusing. Some expect the rest of the world to match their military experiences and are lost when it doesn’t happen. Zinke insists on seeing our nation’s conservation and wildlife management agencies as military branches, which sometimes combine forces on particular missions, and himself as a general leading the fight. The fundamental difference in structures, purposes and operating cultures between Interior, which manages our national parks and natural resources, and the Pentagon, which fights terrorism and conducts military operations overseas, is lost on him. The National Park Service, the U.S. Fish and Wildlife Service, the Bureau of Land Management and other agencies manage our federal lands for balanced use and public enjoyment, but they follow different laws and mandates. There’s a reason you can drill for oil on BLM land but not in a national park. To order agencies with different priorities to work together on some vaguely defined “operational” basis is a recipe for confusion and inevitable staff attrition, though this might suit the Trump administration just fine. It is impossible to criticize this on the merits because not only are there no merits, there seems to be no real plan. Neither Zinke nor his assistants have opened the specifics of their proposed reorganization to public or congressional input. It shouldn’t be too much to ask for Zinke to explain his thinking before he starts making irreversible moves. Until that happens, we’re in the dark. Zinke has provided no data to explain how the move will save time or taxpayer money. It is not based on any demonstrated public demand. Despite his professed respect for military-style operational planning, Zinke is taking an enormous leap forward based on spotty personnel management theories and a hunch that it might work. As the saying goes, if all you have is a hammer, everything looks like a nail. Secretary Zinke’s military career is impressive, but it did not provide him with the broad array of skills his current job demands. The secretary is not at war. He needs to retreat.